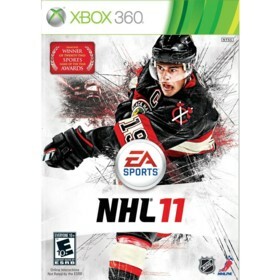 NHL 11 is a Xbox 360 game in the Sports genre. The game was published by EA Sports and developed by EA Canada. The game has an ESRB Rating of E10+ (Everyone 10+) and was released on 2010-09-07. The game's official site can be found at nhl.easports.com/home.action. This is the best hockey game ever...not a huge improvement over last years edition, but everything has been improved. EA has built a new physics engine for this game, refined the graphics and improved the sound and playability for this version. The overall engine and playability has been refined...now it is much harder to knock by players as AI players react better and can now take more "hits". The ice seems more realistic and the passing is more realistic...unlike the "magnet type passing" of older hockey games. The graphics and sound have been improved, reflections, player models and details are all fantastic and improved over last year. Audio is top notch as usual..the two announcers Gary Thorn and Bill Clement call plays efficiently and with excitement. The two gripes I have about the game is that EA decided to allow hockey sticks to brake this year...this feature tends to be annoying due to the frequency at which they occur :( The second minor negative is that they did not really make a huge change from last year..so if you are really happy with NHL 10 you dont have to upgrade right away. Overall this is a fantastic game...EA also chose to include not only NHL, but AHL and CHL leagues in this game this year and with no other offerings this year in terms of hockey (NHL 2k11 is not available for ps3 or 360 this year) this game is a must buy for any hockey fan.